Offer Details: Be one of the first to send a $5 or more Starbucks Gift Card via iMessage and receive a $5 Starbucks eGift Card for yourself. Legal Disclaimer: Valid 4/10/17 through the earlier of 4/23/17 or until all 45,000 are redeemed. Limit one per person. Requires an Apple Pay account and Starbucks iMessage App available on iPhone 5S or above and iOS 10 or above. This offer is open to legal residents of Canada. 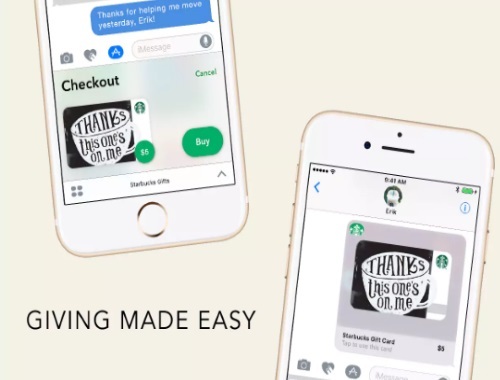 who have an Apple Pay account, have downloaded the Starbucks Gifts for iMessage App with an iPhone 5S or above and are iOS 10.2.1 or above users.